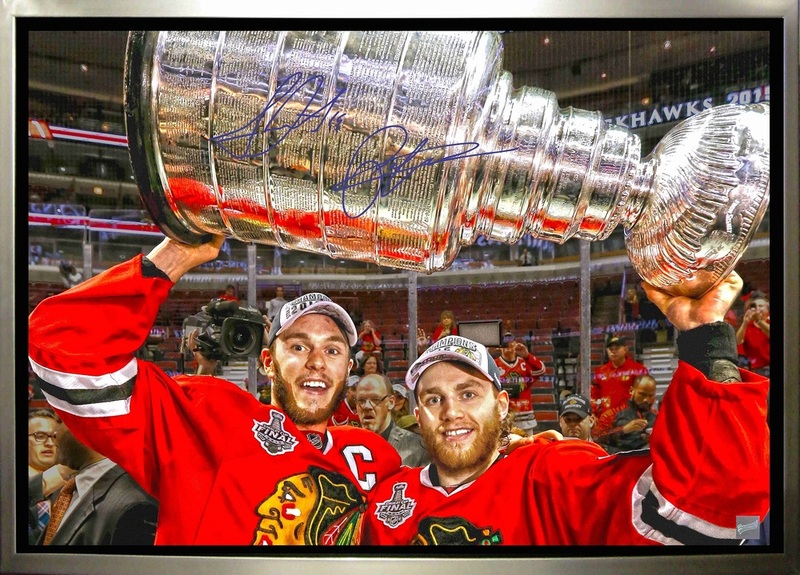 This 2015 Stanley Cup art canvas comes dual-signed by the Chicago Blackhawks' dynamic duo Jonathan Toews & Patrick Kane. The Chicago Blackhawks have won 3 Stanley Cups in the last 6 NHL seasons and have cemented themselves as a modern era dynasty. This is an official 2015 Stanley Cup NHL product and a great collectible that will become a long lasting memory for any fan of the Chicago Blackhawks. A Frameworth hologram and certificate of authenticity are included with purchase to ensure the legitimacy of both autographs. The image has been digitally altered to look like a painting and then printed on canvas. The canvas is then stretched and stapled to the back of a 3/4" wooden stretch bar and set in Frameworth's renowned float-style framing. FINISHED SIZE 21x30".